Every day, Alyson who lives in Sydney, Australia sees a homeless man sitting in the same spot. 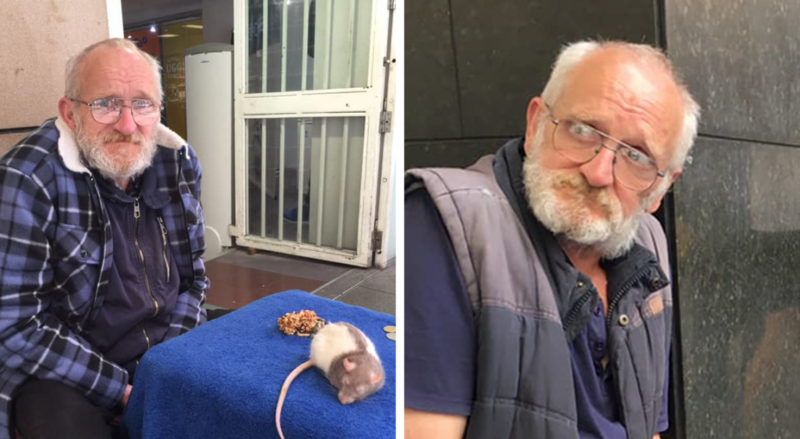 The 59-year-old Chris happily chats to passersby and allows them to play with his adorable pet rat named Lucy. The rat never leaves Chris side and munches on snacks and entertains strangers. However, a couple of days ago Alyson noticed that Chris is alone and distressed. She decided to check on him and noticed his sign telling passersby that his beloved pet was stolen from him. Chris Says that Lucy was probably taken from outside Footlocker on Pitt Street after he briefly left to go to the bathroom. Alyson was completely baffled when she heard the news and called the stealing from a homeless man ‘a low act’. Many people were appalled too. After Alyson published a Facebook post detailing the incident it quickly went viral and received more than 16k shares in a few days. While most of the commenters expressed complete disgust in the lack of humanity of the person responsible for stealing the rat, others tried to figure out the way they can help. Many began sharing photos to help others recognize Lucy in hopes that someone will find her safe and sound. Meanwhile, heartbroken Chris contacted the police. He says that police are checking CCTV in hopes to identify the suspect. However, there is no new information and the saddened man is left in uncertainty if he will ever get his friend back. Over the years Chris and Lucy have become locally known to passersby in Sydney. He and his little friends would often cheer up and befriend strangers. After the news of the despicable act came in, people began sharing they fond memories of the pair, hoping that the pet will be eventually discovered.